OPINION as to their ranking was was varied. It couldn’t have been the Dublin ‘B’ team anyway, because the extended squad was in Jamaica at the time, presumably blissfully unaware that another group of men had won the O’Byrne Cup wearing their jerseys. Was it the Dublin ‘C’ team? Either way, contained within it were a couple of gems, none twinkling as consistently last January as Niall Scully. “I think Niall may have travelled last year,” said Paul Clarke, the man who brought that scratch Dublin selection to an O’Byrne Cup title and who will begin an attempt to repeat the trick tonight in Parnell Park, by way of explaining Scully’s inter-county anonymity prior to last year. The consistency of Scully’s output over the course of the subsequent three weeks in Dublin’s successful O’Byrne Cup run ensured he started their opening league match against Cavan in Kingspan Breffni Park in early February. Scully’s 2017 provided further evidence of Gavin backing the man in possession of the jersey and the most compelling form, regardless of experience and reputation. It is certain also that as soon as Gavin and his management team return from South Africa next week, they will widen their search for new recruits, irrespective of the current quality of his panel. Two of the following four have been named to start tonight's O'Byrne Cup opener, but expect all to be granted their chance early in this year’s Allianz National Football League. “Keep your eye out for one guy, he is a lad from Raheny, Brian Howard,” said Diarmuid Connolly recently in a rare interview on the Blue Is The Colour podcast. “He is going to come on next year. In the next six or eight months, Brian Howard is going to put his hand up for a jersey. “He came on this year in the championship and didn’t put a foot wrong. I was actually surprised he didn’t play a little bit more to be honest. “Even in training, he is a leader. He isn’t a loud guy, in your face or anything like that, but he is a leader with the way he goes about his work. Howard actually made his senior championship debut in 2017 as a substitute against Westmeath in last June’s Leinster semi-final turkey shoot. The young Raheny man replaced his club-mate Brian Fenton late on in the Leinster final victory over Kildare when he scored a point from play. of ‘middle eight’ spots next spring. JUST now, Dublin are blessed with a long, snaking queue of talented and varied inside forward options. But Basquel’s recent form has been too compelling not to notice. Whilst dogged with injuries for most of the Dublin Under-21s All-Ireland campaign, he produced a creative masterpiece in the final against Galway in Tullamore, scoring two points whilst also drifting and distributing to an attack that feasted on quality supply. Basquel was the stand-out forward of Ballyboden’s All-Ireland club win of 2015 and unlike the others on this list, has at least some league experience. He came off the bench in the aforementioned 2016 spring opener against Cavan and started Dublin’s subsequent draw with Tyrone in Croke Park, although he lasted only until half-time on that evening. Basquel’s tendency to be direct, his natural acceleration and his finishing skills off either foot, are obvious. The trick will be in convincing Gavin that he is a preferable option to Con O’Callaghan, Paddy Andrews, Paul Mannion, Dean Rock, Eoghan O’Gara, Bernard Brogan, Cormac Costello, Conor McHugh et al. So said Dessie Farrell of Eoin Murchan after his Dublin team won the last ever All-Ireland Under-21 title in O’Connor Park back in April. The number and identity of the call-ups from that squad into Jim Gavin’s summer panel had been open to interpretation beforehand. But mostly, it was felt that Murchan’s size would rule him out until his oppressive man-marking job on Michael Daly. Daly, son of Galway great Val, is a beast of a man and had been Galway’s bluntest and most destructive attacking implement in their shock semi-final victory over a Kerry team decoratively festooned with All-Ireland minor medals. Murchan, as he did to Stephen McBrearty in Dublin’s semi-final victory over Donegal, drove him backwards at every available attempt and never looked remotely out of his depth physically. His performance in Na Fianna’s recent Dublin Under-21 final win over Ballyboden St Enda’s, although carrying an injury, confirmed that Murchan’s form hasn’t dropped because of underexposure this summer. With noticeably few defenders showing form at club or underage level, Murchan’s rise is likely to bring him to a League XV this spring. Part of the same Na Fianna vintage as Murchan, a group that won the 2010 Féile Peile na nÓg in Derry and has since gone on to collect multiple Dublin minor and Under-21 titles. 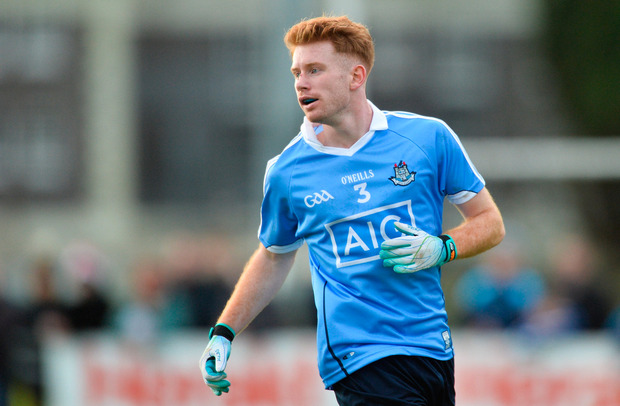 Last year, Byrne won an individual award for being the best player in the All-Ireland Under-21 Championship, an achievement reflected in his three Man of the Match performances across Dublin’s five games. Byrne’s current form appears good also. For what it’s worth, he got three chances in the recent Herald/Dublin Bus Dubs Stars match and scored 2-1. Neither an orthodox wing-forward or corner-forward, although he has been equally effective in either, he would provide a different type of option for Gavin in an area in which he already has huge variation. Byrne possesses rare speed and - a bit like Scully - guarantees a high level of security whilst holding possession and waiting for support runners, even in a thicket of zealous opposition defenders. Unlike the other three, Byrne was not part of last year’s Dublin senior squad, although he has not been named in the panel for the opening O'Byrne Cup in Parnell Park tonight.